We demoed this wonderful sweet dessert on Fox5 News February 26, 2014. It was snowing outside and this made us feel like we were in Hawaii! Preheat oven to 450̊. Line a large rimmed baking sheet with parchment paper. Stir first 3 ingredients in a large bowl until sugar dissolves. Add pineapple; toss to coat. Let marinate, tossing occasionally, for 10 minutes. Place pineapple, one flat side down, on prepared sheet; reserve marinade. Roast pineapple for 15 minutes. Turn, brush with marinade, and roast until tender and caramelized, 10–15 minutes. Drizzle remaining marinade over; let cool slightly. Divide pineapple among plates. Spoon yogurt alongside. Garnish with nuts and mint. Six servings. 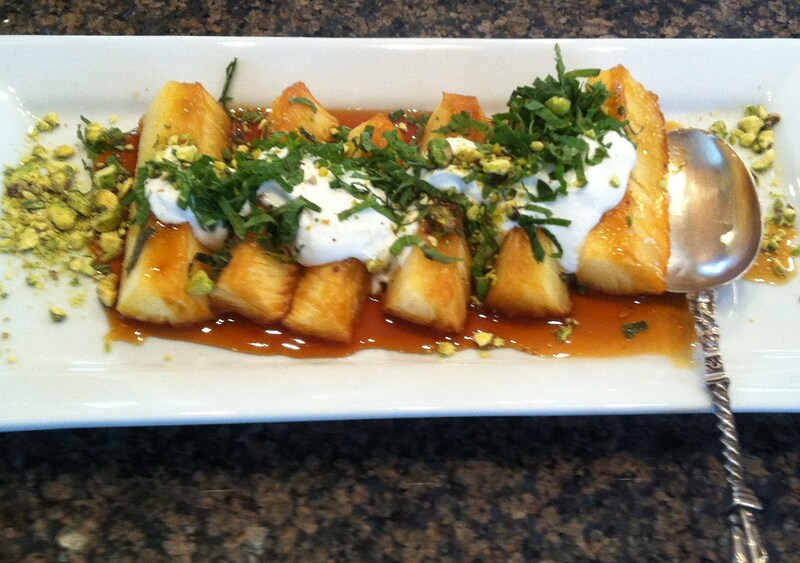 This entry was posted in Brunch, Desserts, Vegetarian and tagged Honey, pineapple, pistachios. Bookmark the permalink.